The Surgery Center of Anchorage is a state-of-the-art full service outpatient surgery center with two operating rooms, a dedicated gastrointestinal procedure suite and a pain management suite. From entry to exit, the interior finishes reflect those found in nature. Coupled with indirect lighting, these two features aid in creating an environment where anxiety and stress is reduced. Patient traffic flows in a circular manner which begins at the semi-private pre-op rooms. 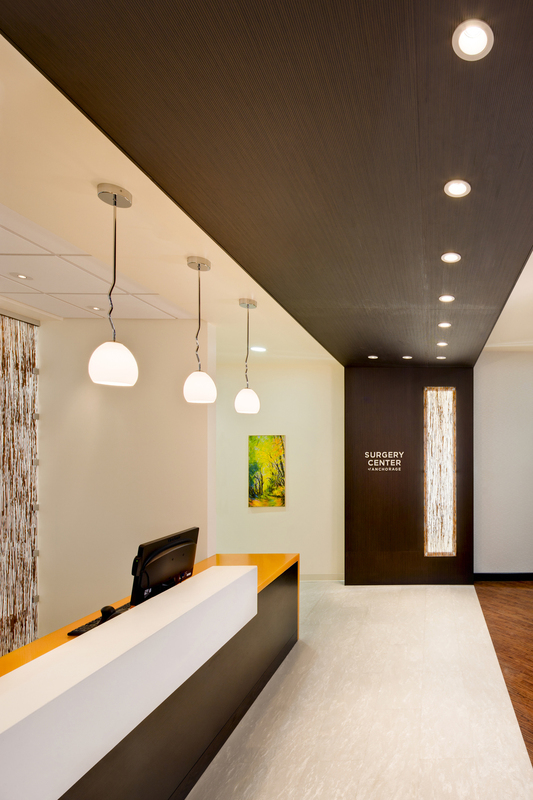 These rooms provide patient privacy while maintaining visual connectivity with staff. After surgery, an open post-op area allows staff to closely monitor patients during the critical stages of recovery. For higher acuity or pediatric patients, two private recovery rooms with an adjoining restroom, are provided directly across from the nurse station. Once ready for discharge, family members reunite with the patient at the recovery bed. Patients leave through a separate exit, which eliminates traffic through the waiting room, where other families are waiting for their loved ones.